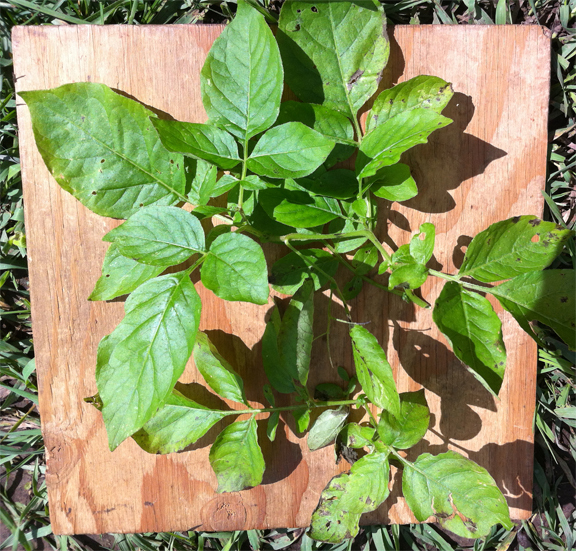 This is the infamous potato psyllid, a major pest of potato, tomato, pepper, and other solanaceous crops in North and the Central America and New Zealand. As I note elsewhere, this species transmitting a disease in potatoes is what got me into collecting psyllids in 2011. 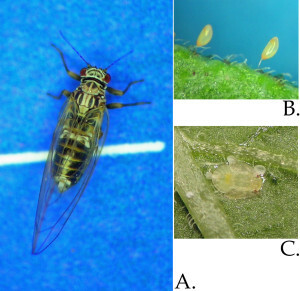 Potato psyllid egg, nymph, and adult. The first fall and winter I collected psyllids I was the first to discover the over-wintering of this psyllid associated with Solanum dulcamara (bittersweet nightshade), following psyllid survival throughout the winter of 2011-12 in the region near my home. 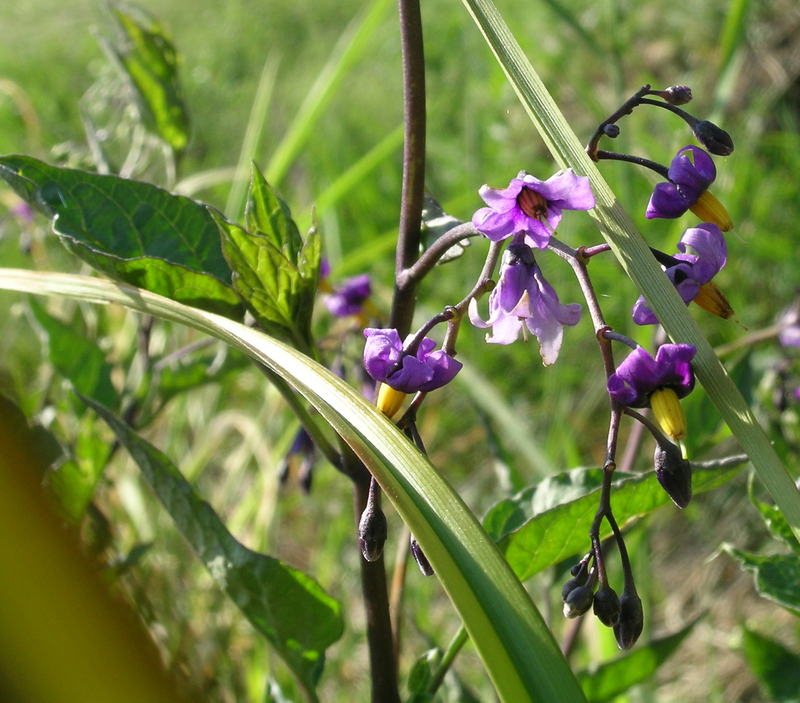 Solanum dulcamara, major host to potato psyllid in the Northwest. Murphy A.F., S.I. Rondon, and A.S. Jensen. 2013. First Report of Potato Psyllids, Bactericera cockerelli, Overwintering in the Pacific Northwest. American Journal of Potato Research 90: 294-296. I’ve also been lucky enough to study this psyllid in the field in its native habitats in the Southwest. The discoveries I made were not original, but the fun was the same, and the story I tell from my discoveries is a bit different from what others have told. Starting in fall of 2013: we were traveling through SW Utah on the way to Flagstaff, Arizona. I collected some aphids and psyllids on grey rabbitbrush (Chrysothamnus sp. or sometimes Ericameria). At the time I did not look closely at the psyllids, but when back in the lab I noticed they were potato psyllid. On the same trip I found potato psyllid adults on rabbitbrush in two other places on the north flanks of the San Francisco Mountains north of Flagstaff, Arizona. What struck me was that a.) there is no agriculture anywhere near these places, I mean many tens, perhaps hundreds of kilometers away; and b.) these shrubs each had several potato psyllids on them. The latter indicated that the plant was actively used as a shelter plant. This story continued in 2014 when we were in the forested White Mountains of southern New Mexico. There, I was hiking one day with the dogs on the slopes east of Sunspot observatory at about 2500 meters elevation, and found wild potatoes growing under many of the trees. Solanum fendleri leaves, each had several potato psyllids. And, these were very ordinary looking potatoes, more plain-looking than I expected wild potatoes to be. 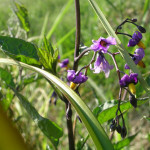 They turned out to be most probably Solanum fendleri. Living on these potatoes was potato psyllid. Following these finds, my theory of pre-agriculture potato psyllid movement is: the psyllid prefers potato, and finds it in the forests where it lives all summer. In the fall it migrates down-slope to shelter plants such as Chrysothamnus and perhaps spends the winter there, or perhaps moves to lowland Solanaceae, of which there are several species in places like New Mexico and Arizona. Then in spring, the psyllid re-migrates back up the slopes to the high elevations and its favorite: potatoes. This kind of elevation-oriented migration is common in aphids and, quite reasonable to think, in psyllids as well.